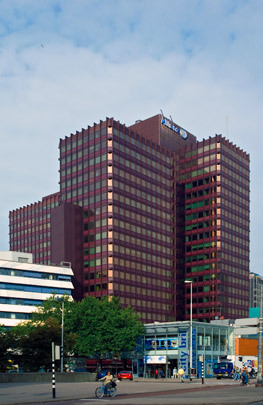 Rotterdam is the pre-eminent Dutch city when it comes to high-rise, beginning with Het Witte Huis, the country's first skyscraper. High-rise was made possible by such technological advances as the lift (1854) and the use of steel and reinforced concrete. Of course, taller buildings had been erected before, such as the 64 metre tall tower of the St. Laurenskerk. The record then passed in 1931 to the electricity board building (64 m.), then to the Medical Faculty (114 m.) and the headquarters of Nationale-Nederlanden (151 m.), to the Maastoren, with 165 metres the tallest building in the Netherlands. Of course Rotterdam's skyscrapers are small fry by international standards. The 381 metre tall Empire State Building had been built in New York back in 1931. And the Sears Tower in Chicago (443 m.) dating from the 1970s held the record height until recently. These days the tallest skyscrapers are to be found in South-East Asia. Poor soil conditions make the Netherlands less suitable for superhigh-rise of this order. Rotterdam's tallest skyscraper is not among the world's 200 highest buildings and Rotterdam itself is 77th in the Skyscraper Cities Ranking List. The 1970s saw an initial modest wave of high-rise in the shape of the Bouwcentrum, Coolse Poort and the second Shell building. This 95 metre tall 'final erection of capitalism' led to a moratorium on high-rise in the city centre, and small-scale became the buzzword. As the 1980s dawned, interest in high-rise gained a new lease of life with the construction of the green mirror-glass clad WTC tower (93 m.) above the Exchange, the symbol of Rotterdam's new zest. Since 1986, a great many tall office buildings have been realized in the centre, notably along Weena, Coolsingel and Boompjes. High-rise built since 1998 has been concentrated in a zone running from Central Station to Kop van Zuid. A number of high-rise projects in this high-rise zone are worthy of individual mention. The reconstruction-era premises of Rotterdamsch Nieuwsblad, a regional daily newspaper, were demolished to build Coolse Poort. The arrival of this high-rise deflected the sight line down Coolsingel to the left to Leuvehaven. The complex consists of three parts about a central reinforced concrete core for stability containing vertical circulation and service shafts. Its burgundy-coloured glass and aluminium curtain wall earned it the nicknames 'Aubergine' and 'Red Beet'. Standing opposite the historic Schielandshuis is the 101 metre tall Schielandtoren with its 31 storeys and 109 rented apartments. Originally there were plans to erect an office tower here but it was decided in favour of a residential function to help keep the inner city a vibrant place. It relates in scale and height to the largely glass and metal office towers in the vicinity, yet deviates from them by having brick facades. Its architect, Pi de Bruijn, rather than mix precast concrete elements with brick, opted for traditional brickwork, a medium seldom come across in high-rise. Chicago comes to this part of the centre of Rotterdam with De Witte Keizer, a 107-apartment, 70 metre tall tower. The three lowest above-ground levels contain office and commercial units, with a fully automatic car park in the basement. Horizontal and vertical bands and rough surfaces enliven the cladding of white concrete panels. For years there had been plans to erect high-rise on the very site of the Incassobank. When this last-named was declared a city monument, this construction work had to be done next to it instead. De Coopvaert, a new 104 metre tall residential tower, is raised up on three concrete columns to retain a view of the Incassobank's remarkable corner. The lowest levels contain office space, above which is a solid transitional structure for storage and plant, with 119 apartments above that on the ninth to the thirtieth storey. There is a separate block for parking at the rear, reached from the tower by a walkway. The sand-coloured concrete facades stress the building's verticality. The arrival of the Erasmus Bridge necessitated redeveloping the open space of Willemsplein. The 90 metre tall 'Hoge Erasmus' boasts 68 swish apartments, with office space in a rectangular basement and parking concentrated in a separate portion. The undulating facade mirrors the bend in the river, with two apartments along it instead of one. The rectangular volume at the rear contains lifts and stairs and a single residential unit facing the city. A quintet of penthouses top off the building. With its height of 165 metres, the Maastoren at Kop van Zuid is to be the tallest building in the Netherlands. Commissioned by Deloitte, an accounting and special services firm, the tower has been the target of local protest, mainly levelled at the planned car park occupying its lowest ten storeys. Its two slabs of 108 and 161 metres high are clad with a light-grey aluminium sheathing, so that the building reflects the sky.